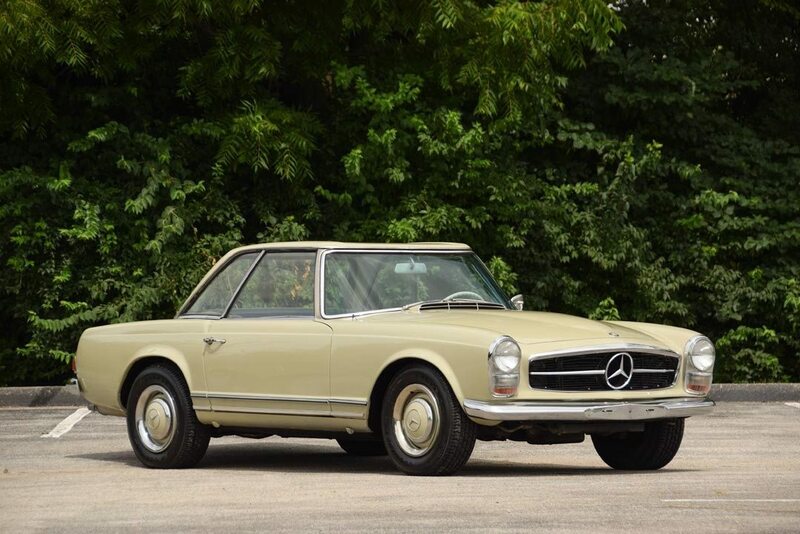 First introduced to the world at the 1963 Geneva Motor Show, the new Mercedes Benz W113, better known as the 230 SL, certainly had some big shoes to fill. It was slated to be the replacement for both the iconic 300 SL and the smaller 190 SL. History shows us that the 230SL wasn’t so much a replacement, though, as it was a significant change in direction for the Super Light line, bringing the American market an emphasis on luxury while retaining an essential sportiness, something lead engineer Fritz Nallinger termed “motoring happiness”. The fresh new 230SL was a sales success, immediately doubling the best results of the previous 190SL, and has become a car that has proven to be a landmark design with undeniable collector appeal. 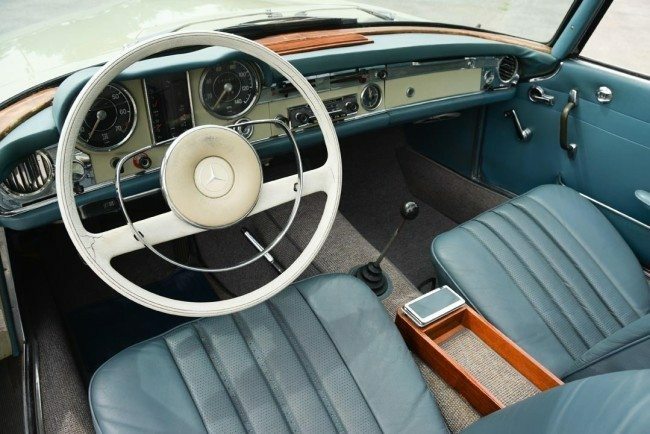 Perhaps the most distinctive new feature was the removable hardtop penned by designer Paul Bracq, which had a slightly concave center section with raised edges, a clever touch that effectively improved cabin visibility and created much easier access. 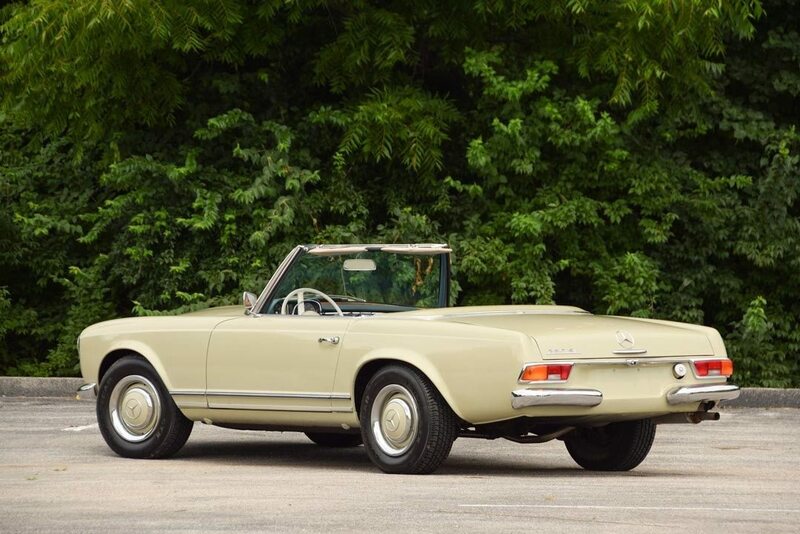 It also gave the car a distinct look, soon earning it the familiar nickname “Pagoda”. Not too extravagant or overly aggressive, the clean new styling is instead elegantly proportioned, and of course, the 230 continues the Mercedes Benz tradition of impeccable build quality. Collectors enjoy the attention these cars get, and the easy availability of parts and the well-established and enthusiastic community of fellow Mercedes Benz owners opens up a world of collector car opportunities to the new owner. Power is provided by the robust and reliable fuel-injected straight-six engine installed at the factory, mated to a supple and fully-synchro 4 speed manual transmission. The W113 was a very early adapter of safety considerations like planned deformation zones to protect the passengers, and the lack of any sharp edges that began in the design stages. The engine in this example is silky smooth with good power delivery, and the total package is tight and handles well. Top speed is listed as 125 MPH, thanks to a high compression head and new 6-nozzle Bosch fuel injection, with front disc brakes and power-assisted rear drums to reel in the fun. 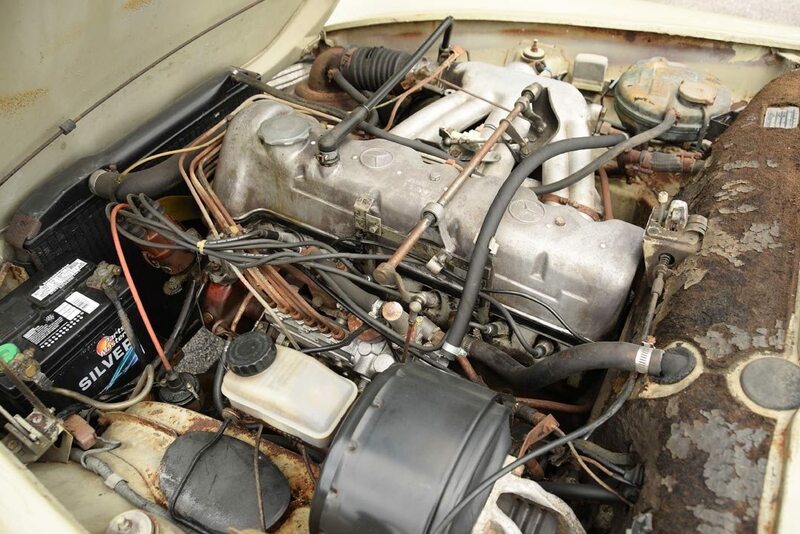 This highly presentable 230 SL is largely original and wearing its miles gracefully. It was originally sold at Worldwide Motors in Indianapolis, Indiana, and included in the sale are many original documents, including instructions for the original Becker radio which is still in the car. The shipping invoice, warranty papers, and service records are included, in addition to both the hard and soft tops. The original turquoise leather upholstery and carpets are also in good condition and show the careful use this car has received. Elegant aluminum bodywork, powerful brakes, and excellent suspension make this lovely 230SL a pleasure to drive, and a car that is certain to turn heads and continue to appreciate in value.